New Volkswagen XL - Unveiled at the 2011 Qatar Motor Show, VW's amazing XL1 two seater diesel electric hybrid is a cool super car where miles per gallon matter more than miles per hour. The XL1 will be the most fuel efficient car in the world, capable of a mind-blowing 313mpg, it saves the planet, saves you loads of money on petrol and is a seriously cool car to look at and drive. The XL1 is the perfect showcase of VW's ability to develop world-beating technology and engineering solutions for the cars of the very near future. VW say the XL1 will be on the road in two years costing between £30,000 and £40,000. 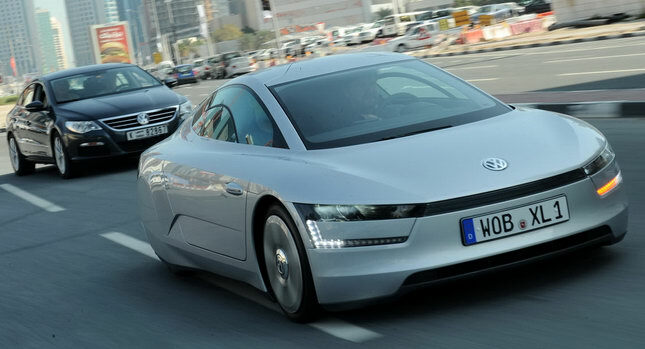 VW will produce a limited series of the 800cc diesel/electric XL1 in 2013. But you will be driving affordable mainstream versions of VW's Polo, Golf and the new Up city car that uses the same engine technology in three years. In normal operation, the car stays in electric drive until full throttle is used, speeds exceed 62mph or the battery charge is down to 20 per cent. In e-mode, the car remains on battery power until 10 per cent of its charge remains (about 22 miles), whereupon the motor starts to charge it and power the vehicle. The recharge time is just over an hour using a 240V British household supply (half an hour with a 360V supply). The 2.2-gallon fuel tank gives a range of about 340 miles. Price/on sale: Volkswagen genuinely don't know what price they are going to charge for the XL1 in 2013, it depends how exclusive they intend to make it and whether they retain all the expensive technology. We guess somewhere between £30,000 and £40,000.